Two Day Only Sale! 38% off through 3/14/16. The Leprechaun Madness! green Irish t-shirt features glow in the dark print. This exclusive design Irish t-shirt from The Irish Gift House features our Shamcus design on the back below the collar! 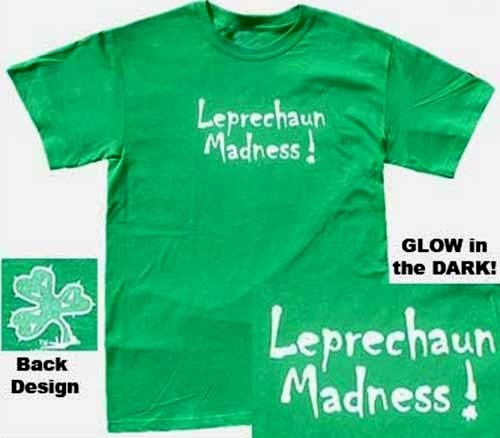 This Irish t-shirt features an amusing glow in the dark print design that says Leprechaun Madness! This 100% pre-shrunk cotton t-shirt in Irish green is a fun design for St. Patrick's day or for any day and it is available in adult sizes medium through 3XL.